“Chaile tumi hariye jao.. rajahin kono rajje..,” (lose yourself if you want to…in a kingdom with no kings) a popular song from their latest album 'Rajahin Rajje' by 'Shunno', is what one may hear all around the city. The song is from their latest album 'Gorbo Bangladesh', and the title song itself is a very inspiring and uplifting track. The proud band members, posing after receiving awards. Other than this motivating song, the album is soothing to listen to when you are out in your car, going on a drive or just sitting back at home and listening to something that might cool your mind. A band filled with talented musicians, starting with Imrul Karim Emil (vocals/keyboard), Shaker Raza (guitars), Michael Gomez (bass) and Rafatul Bari Labib (drums), they have a good number of songs up their sleeves. The band has come a long way since it started off in 2007. Who knew a small band like this would be producing their third album by now. 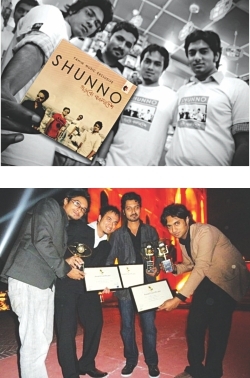 And that's not all; they even won the Sixth Citycell- Channel-i Music awards 2010 for the best band award, while Shaker Raza won the Best Sound Engineer award. They are also planning on making a tour all around Bangladesh to promote their new album. 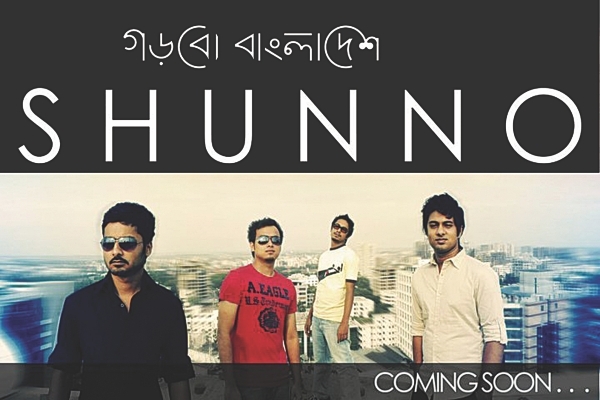 So fans of 'Shunno', living in Chittagong and Syhlet, the waiting is over. They are coming to your city this winter with a whole set of new tracks and other surprises. And many students just like Maruf and Sahir have different views on the band. So, if you don't have the album yet, stop wasting your time for it to come to you. Go out and get it, because it's worth it!